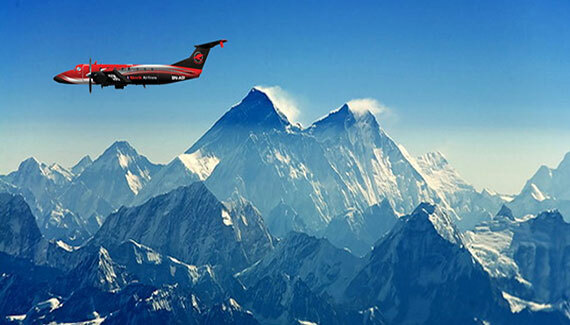 Everest Mountain Flight – 1 hr are an ideal way for domestic and international tourists wanting to explore the beauty of the mountains without having to spend as much time, energy or money. Such flights not only appeal to nature lovers and adventure enthusiasts, they also attract trekkers and serious climbers because of the unique experience that the flight offers. The mountain flight presents breathtaking panoramic views of the best Himalayan ranges in Nepal in a short period of time, without making you go through all that effort of trekking to the top. Mountain flights in Nepal are operated by different domestic airlines in the Kathmandu Valley in their small, but incredibly safe, aircraft. These mountain flights give you the best opportunity to get that close to the majestic Himalayas and enjoy unparalleled views of the iconic Mount Everest (8,850m) and many other mountains. All mountain flights in Nepal are operated daily early in the morning from Kathmandu airport flying at an average elevation of 6,500 – 7,000 meters. During the flight, each passenger is offered an individual window seat. Moreover, passengers are invited to the cockpit from where they can take some spectacular pictures of the world’s tallest mountains. Travelers take off from Kathmandu early in the morning for an hour’s worth of spectacular mountain scenery. Gauri-Shanker is sharp and very conspicuous during the mountain flight. As the plane moves towards the land of rising sun, passengers get close-up views of the Eastern Himalayas, featuring a succession of glorious mountains. A trip to Nepal must include this wonderful experience of an hour mountain flight in Nepal. You will be rewarded with stunning views of all the eight majestic 8,000m (26,000 ft) mountain ranges that tower over other lesser known mountain ranges, which nevertheless still stand tall in all their grandeur.